Donald J. Guter is the president and dean of Houston’s oldest law school, South Texas College of Law Houston. 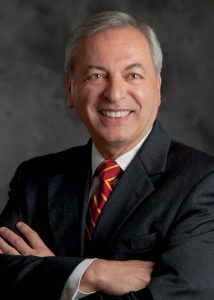 Dean Guter is the former dean of Duquesne University School of Law in Pittsburgh where he served from 2005 through 2008. Dean Guter served in the U.S. Navy for 32 years, retiring in 2002 as a Rear Admiral, Judge Advocate General’s Corps (JAGC). He climbed the ranks of the JAG Corps from trial counsel to legislative counsel, to special counsel to the Chief of Naval Operations, and ultimately became the 37th Judge Advocate General of the Navy from 2000-2002. He has since served as the CEO of the Vinson Hall Corporation and the executive director of the Navy Marine Coast Guard Residence Foundation. He currently chairs the American Bar Association’s standing committee on Legal Assistance for Military Personnel and is an outside director on the Board of TYCO Corporation. Frequently appearing in the media to discuss matters of national security and military law, he has made appearances on network and international newscasts, radio programs, and in print media nationwide.